L-R Ravi Akelia,Director, Technology Solutions, AMESA, IQVIA in Technology ; Remi Adeseun, Country Manager, West Africa, IQVIA in General; Pharm Ahmed Yakassai; President, Pharmaceutical Society of Nigeria; Prof. Mike Ogirima, President, Nigeria Medical Association;Prince Julius Adelusi-Adeluyi, President, Nigerian Academy of Pharmacy, and Dr. Femi Olugbile, Chairman, IQVIA HCPSpace Advisory Board, during the MOU Signing Ceremony at the official launch of the IQVIA HCPSpace in Lagos, recently. Healthcare professionals in the country have been urged to leverage communication and networking in to improve the networth of health service given to the patients. The appeal came from Prince Julius Adelusi-Adeluyi, Chairman of the occasion and President, Nigerian Academy of Pharmacy, who encouraged professionals to become early adopters in the use of digital health platforms that will positively improve patient outcomes. 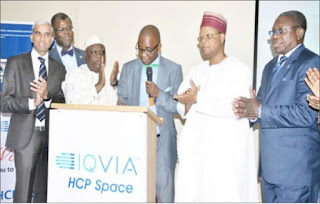 Adelusi-Adeluyi made the appeal at the launch in Nigeria of the IQVIA HCPSpace, a digital healthcare platform, by leading global provider of information, innovative technology solutions and human data science, IQVIA, formerly known as Quintiles IMS. IQVIA HCPSpace is a web and mobile based platform designed to bring together all specialties and sub specialties of doctors, pharmacists, nurses, medical laboratory scientists, and all other healthcare professionals, where they can connect with peers, follow Key Opinion Leaders (KOLs). It will also serve as a platform to discuss medical cases, establish public/private groups, view videos for increased knowledge, earn Continuing Professional Development (CPD) points from content provided by approved bodies and KOLs. Similarly, healthcare professionals would find jobs and career opportunities across multiple regions in Africa and the Middle East under the platform. He said that IQVIA’s HCPSpace is a bridge-building tool that would encourage collaboration among healthcare providers whilst driving efficiency, performance and capacity utilisation as well as innovation in the nation’s health space as a whole. 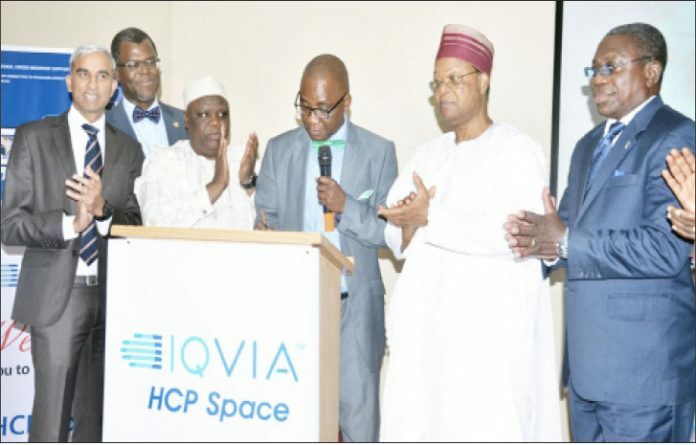 “I would like to commend IQVIA for trying to crack a problem that has remained with Nigeria for quite a while giving the numbers of government committees that had been set up in the past to solve the challenge of inter-professional collaboration and promote harmony in the health space. “This tool will be a blessing to the nation as it will radically alter Nigeria’s health landscape for good and help to reduce unnecessary competition among professionals,” Adelusi-Adeluyi stated. Dr. Femi Olugbile, Chairman of the IQVIA HCPSpace Advisory Board, pointed to the growing domestication of technology for personal and professional use across the world as well as creating a sense of team in community via multi-specialty task performance and problem solving tools. He also noted that healthcare around the world faced imminent disruption as evidenced by an alliance announced recently by three heavyweights in Corporate America – e-commerce giants, Amazon, global multinational, Berkshire Hathaway and Investment bank, JPMorgan Chase. “The HCPSpace provides a solid platform to prepare for the imminent disruption of the nation’s health space,” he stated. Olugbile added, “All over the world, there is an increasing awareness that communication and collaboration are essential ingredients for the creation of a thriving, high-achieving healthy work force, as well as a system that delivers good quality healthcare to patients. Providing the reason for the platform’s existence, Pharm. Remi Adeseun, Country Manager, West Africa, IQVIA in General, recalled that a communiqué was issued at the end of the Inter-Professional Collaboration Symposium organised by the Nigeria Academy of Pharmacy in collaboration with the Pharmaceutical Society of Nigeria (PSN). The event which held on May 11, 2017 at the University of Lagos, encapsulated an eight-point resolution, and underscored the need to deepen the concept of universal communication and collaboration among healthcare professionals via tools that are yielding documented benefits and gains in the healthcare sector across the world. “We are very confident that the IQVIA HCPSpace will help improve the healthcare professionals’ practice, patient experience and produce desired healthcare outcomes. “This is premised around the tool’s great value proposition for individual and general development, knowledge sharing and relationship building, and I urge all persons who recognise the need to take Nigerian healthcare to the level of proficiency and prominence that it deserves on the world stage to embrace this platform,” Adeseun added. Dr. Abiola Idowu, Director, Planning Research and Statistics, Lagos State Ministry of Health, who represented the Commissioner of Health, lamented the underutilisation of networking platforms in the health sector and the urgent need to establish global competencies and standards to support the improvement of quality of care as well as create synergy among health care professionals.